Jelly Belly sure does have a corner on the Flavors No One Really Asked For department, eh? 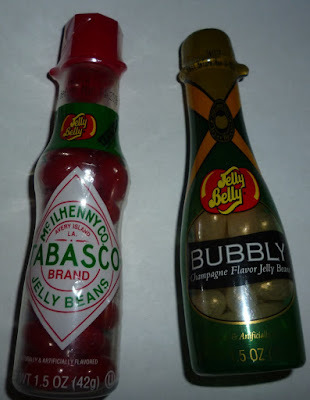 That's right, today we are going to try out Tabasco flavored jelly beans and champagne flavored jelly beans. Tabasco first: I thought maybe, just maybe, there was an outside chance that this might simply be cinnamon with a little spice added to it, but nope: you get the full-on, mashed-red-pepper-based, spicy aftertaste experience. Which is gross. Even if you like Tabasco sauce, it's just not fun to, um, chew it. You can probably skip the Tabasco one unless you're the sort of person who receives plush bottles of Tabasco sauce for your birthday. The champagne one actually isn't bad, although i can't imagine eating more than a few on occasion, so a small bottle you can share is about right. I didn't have the nerve to mix the two at once. Feel free to let me know how that goes.